We specialize in Wingshooting Safaris/Game Bird Hunting, Dangerous Game, Rifle and Bow Hunting. As the leading wingshooting outfitter in South Africa and neighboring African countries we offer UPLAND BIRDS, WATERFOWL, ROCK PIGEON and DOVES as well as plains game in one location as well as dangerous game hunts. The following game bird species can be legally hunted namely guinea- fowl, swainsons francolin, orange river partridges, common quail, spurwinged geese, egyptian geese, yellow billed duck, redbilled teal, rock pigeons, redeye doves, cape turtle dove and laughing doves. Rawhide Safaris provides hunting safaris for hunters from abroad in the whole of South Africa and other African countries. Whether you would like to embark on a 5-day wingshooting safari or a 30-day plains-game and dangerous game safari, we will be able to accommodate you. Our base camp is situated at Kroonstad – Free State Province, and only a 2 hour drive from Oliver Thambo International Airport (Johannesburg International Airport). Our safaris are put together and taken care of by a team of dedicated people who have extensive experience of wingshooting, rifle- and bow hunting in Africa. Our professional hunters are the best and are selected for their ability to work with people, friendliness, responsibility, ethics, attitude and many more. You can say they are also hunting outfitters in their own right. We are dedicated in providing you with a very well balanced hunting safari at very competitive rates. We offer some of the finest safaris in Africa, comparable to the best anywhere in the world today and the best service that is certainly more than the value you can get anywhere else for your money. 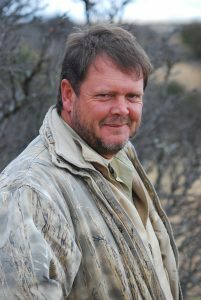 Henk Engelbrecht is the hunting outfitter and owner of the company Rawhide Safaris cc. He has more than 20 years hunting experience in Africa, whose interests in hunting started from a very young age. Wingshooting and Plains Game hunting is his passion. In the past 15 years he commenced hunting with a compound bow. The origin of the name “Rawhide” lies in the large quantity of game that was found in the Free State province and harvested during the pioneering of the interior (1800’s). The skins were cut into strips and dressed into rawhide lariats, thongs & strops. This area has now some of the best wingshooting habitat that you can find anywhere in the world due to the grain that’s been planted.